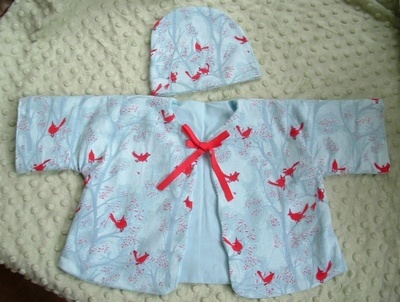 I'm so excited about this jacket and hat set--I made it for Adelaide from the vintage pattern below. It's with my absolute favorite fabric of all time--the Munki Munki cardinal jersey (thank you, thank you Jessie!! What kind of a friend not only KNOWS what your favorite fabric is, but then gets you that fabric for your birthday, when it's nearly impossible to find? A damn good friend, I tell you!). I'm digging this pattern--I love that it's lined, so it's all comfy and cozy, and I really adore the scalloped edging on the front. I told you I got a lot of crafting done this weekend!! Most of these are jersey on the outside (lots of Munki Munki here--I must be making room for the NEW line), with flannel on the inside, so they're pretty thick and warm. 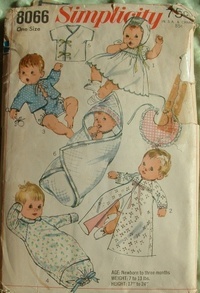 I have a few baby showers coming up that I might use these for, but I might start stocking up on them for the craft fair I'm doing next month (I told you I was insane).